Resourceful. The room was full of professionals who all shared the same goals. I appreciated the staff allowing all the participants to ask questions and to offer up different perspectives. The facilitators were extremely knowledgeable, and we could tell they had clearly done their research. 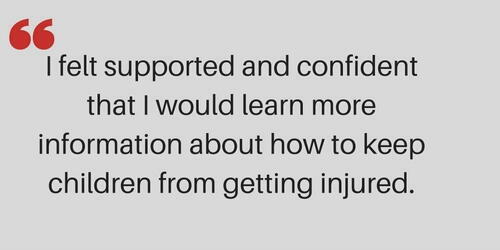 Why did you participate in the SKIPP training? We participated because we work with hundreds of children a year. We are able to engage with our families on a daily basis – we meet them in the community, in their homes, and at our location for services. We have direct access to families with children as young as six weeks up to 21-years-old, and we can train them from the start about how to keep their children safer. We have already implemented a seminar with our parents to discuss ways in which they can focus on positive parenting. The next seminar will include statistics that we learned from SKIPP and practical ways that our parents can promote safety in their environments and safety in their homes. For example, parents could be encouraged to research the statistics in their community or to check with the NC Highway Safety program to get more information. Parents can also participate in forums to discuss child safety. There are opportunities now to train our families as we have a Life Skills program that happens each week. We are able to conduct seminars and trainings as often as we need to. We also have room to schedule future trainings that are specifically about child safety. I honestly wish there were more initiatives out there that focused on keeping children safe. I appreciate projects like SKIPP and a few other ones that take the initiative to bring about awareness. Since we have direct access to parents, agencies and programs that serve children, seminars to unite our programs could be a good way to address childhood injury.